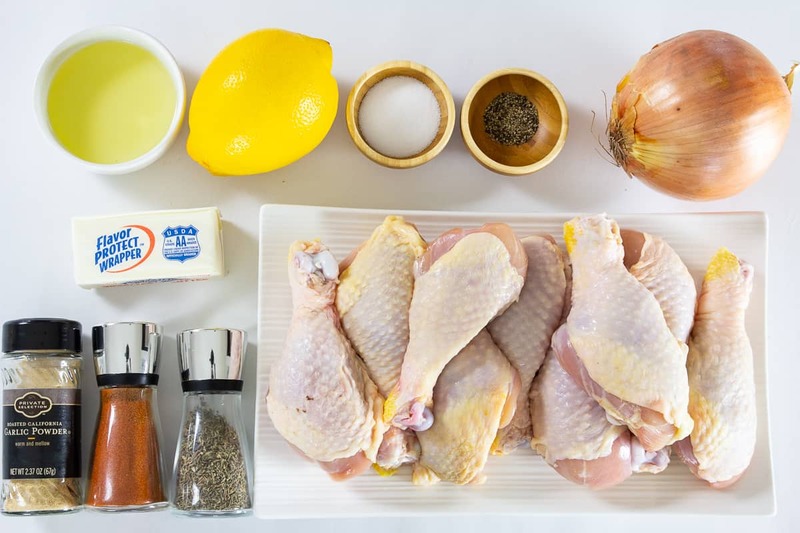 This crispy baked lemon chicken recipe is super easy, quick, and healthy. It’s so tasty you won’t believe its Whole30, Keto and Paleo approved. This will taste divine with my garlic asparagus on the side. This recipe was originally posted January 12, 2016, we’ve tweaked it a bit since then. This post may contain affiliate links. Read my disclosure policy here. 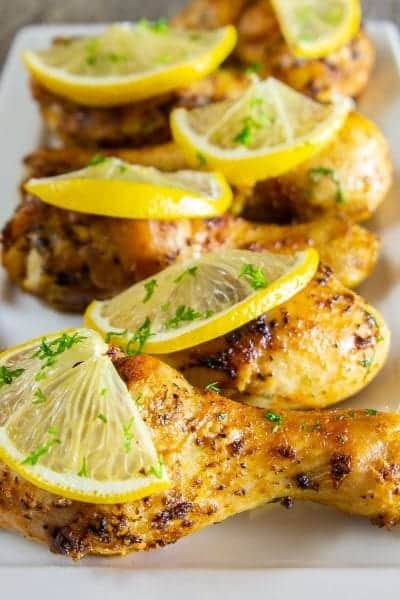 Lemon chicken is a quick and healthy option for dinner. If you’re one of those people who like to do as little prep work as possible when cooking, this recipe is for you! This recipe could also be Paleo/Whole30 if you omit the butter. I add the butter because it gives the chicken more flavor. Serve this tasty chicken with mashed potatoes and a salad of your choice. You’ll find the complete, detailed instructions in the recipe card at the bottom of this post. Here’s a quick overview of the recipe first, with step by step pictures. 1. In a large bowl combine the salt, paprika, thyme, garlic powder, and black pepper. 2. Add the drumstick to the bowl and toss to coat evenly. 3. Slice the lemon and onion. 4. Heat olive oil over high heat in a large skillet and brown each side of the chicken. Don’t fully cook them. 5. Line the bottom of a 9×13 inch baking dish with the sliced onions. 6. 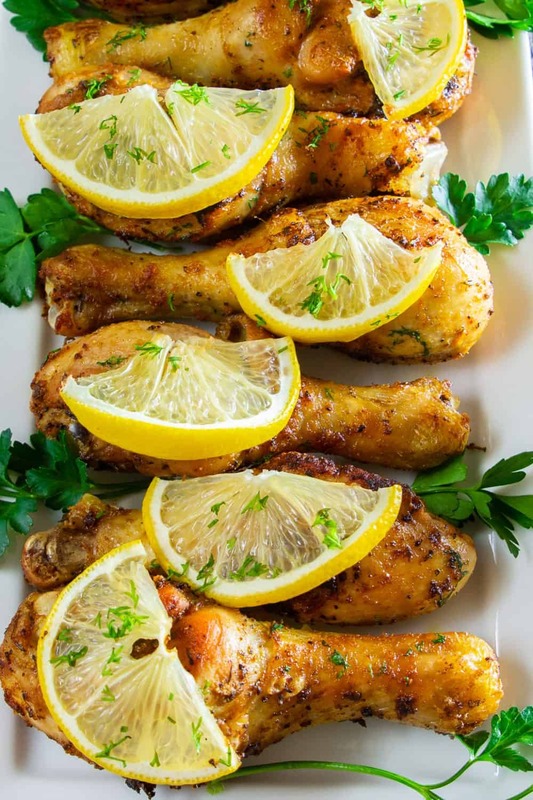 Place the browned drumsticks into the baking dish and add half a slice of lemon and a small slice of butter on top of each drumstick. 7. Bake at 380 degrees Fahrenheit for 1 hour or an hour and 15 minutes. How long does it take for drumsticks to cook? I always cook chicken legs for a little over an hour. You should always cook chicken legs until the internal temperature reaches 180 degrees Fahrenheit. This article from Better Homes and Gardens has a complete list of cooking times and temperatures. What should I serve with drumsticks? Drumsticks make a really filling meal, you won’t need to serve much with them. I love serving lighter sides with them like salad and fresh vegetables. 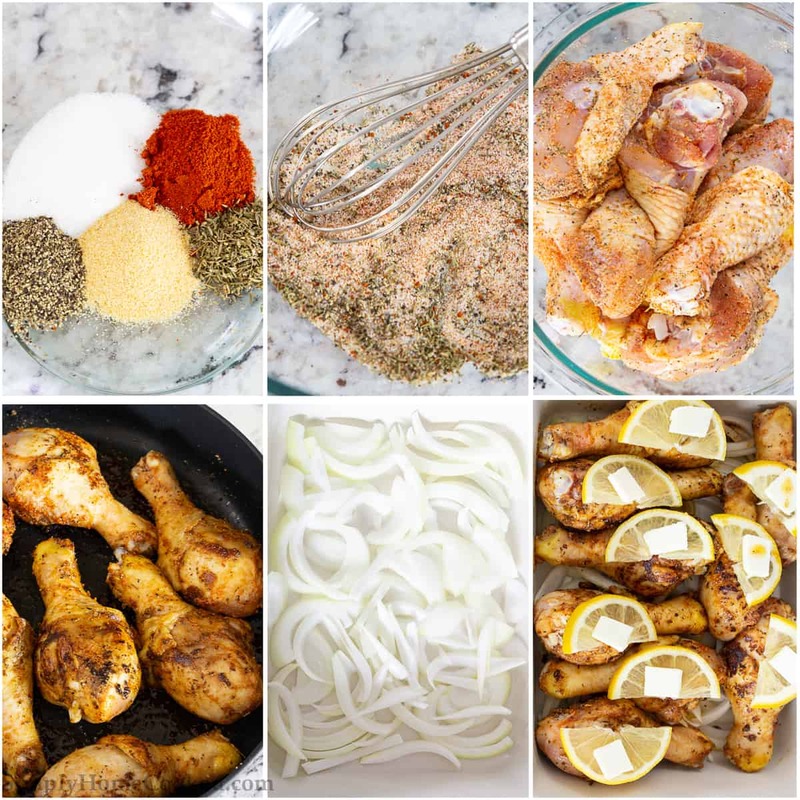 This crispy baked lemon chicken recipe is super easy, quick, and healthy. It's so tasty you won't believe its Whole30, Keto and Paleo approved. In a large bowl combine the salt, paprika, thyme, garlic powder, and black pepper. Add the drumstick to the bowl and toss to coat evenly. Slice the lemon and onion. Heat olive oil over high heat in a large skillet and brown each side of the chicken. Don't fully cook them. Line the bottom of a 9x13 inch baking dish with the sliced onions. Place the browned drumsticks into the baking dish and add half a slice of lemon and a small slice of butter on top of each drumstick. Bake at 380 degrees Fahrenheit for 1 hour or an hour and 15 minutes. Making it tonight and I can’t wait!! Can I just bake them without browning in skillet first? I’m sure this would affect the time? Hi Rhonda, you can definitely bake them only in the oven but they will need to bake longer. I’m not sure how much more longer since I’ve always used the browning method. Thank you so much my husband love the lemon chicken he ate 6 legs. That’s awesome Regina 🙂 Glad he enjoyed them that much lol. My family always makes these too. We love how quick it is to make.